(April 2, 2013) — The last weekend of April, the Cantemus chamber chorus will close out its third decade of musicmaking on the North Shore with a pair of anniversary concerts: “Cantemus Turns 30: Celebrating Artists of the North Shore” is a program of songs written by renowned contemporary composers and based on texts by some of the area’s best-known poets. As a highlight of this 30th anniversary season, Cantemus has commissioned a new choral work by Brandeis University’s Composer/Resident Scholar Ruth Lomon, entitled Contemplations. Cantemus will premiere the work at their concerts next December. Begun in 1982 as an eight-member madrigal group that performed at church services in exchange for rehearsal space, Cantemus has grown to 40 members, with a budget that lets them rent rehearsal and performance venues, engage guest artists often for their twice-yearly concerts, and commission works written expressly for them. From its inception, Cantemus has been directed by some of the area’s best choral conductors. From Founding Conductor Edward Lundergan through Robert Ruplenas, Robert Dean, Robert Littlefield, and Michelle Montgomery Muth, to John Hoffacker, Gary Wood and, now, Music Director Jane Ring Frank. Frank is well known in the Boston area as the Founder/Artistic Director of the critically acclaimed professional chorus Boston Secession. Cantemus opened its anniversary season last December with concerts entitled “Twilight in New England: A Celebration of New England Composers.” Developing the program for these April concerts presented a bigger challenge for Frank. Though her original plan was to include both North Shore composers and North Shore poets, she confesses: “I came up short on the North Shore composers end. I found the answer in programming those masters of wordplay and meaning, poets and writers who have inhabited the North Shore.” Most of the composers are from New England. The writers she selected are Nathaniel Hawthorne (Salem), Robert Frost (Lawrence and Amesbury), Anne Bradstreet (Ipswich and Andover), and John Greenleaf Whittier (Amesbury). Their compelling texts were set to melodies and harmonies by New Englanders Randall Thompson, Gwyneth Walker, Ronald Perera and Daniel Pinkham. 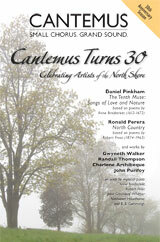 New England composer Ronald Perera also captures Frost’s love of the natural world in his collection North Country, a setting of five early Frost poems. Often called “America’s first poet,” Anne Bradstreet was born in 1612 in England but sailed to Massachusetts in 1630, first living in Cambridge, then Newtowne and then Ipswich, before moving to Andover. In 1650, without her knowledge, Anne’s brother-in-law John Woodbridge took her manuscript poems to England to be published under the title The Tenth Muse, Lately Sprung Up in America, by a “gentlewoman in those parts.” Boston composer Daniel Pinkham’s 1995 The Tenth Muse is a richly textured setting of five of Bradstreet’s lyrical nature and love poems. Two of Bradstreet’s poems, “If ever two were one” and “The Cooling Shadow,” are reprised on the program in settings by Vermont composer Gwyneth Walker and Charlene Archibeque, respectively. It is poetry by Bradstreet that inspired Ruth Lomon to create the Contemplations song cycle that Cantemus will perform next winter. 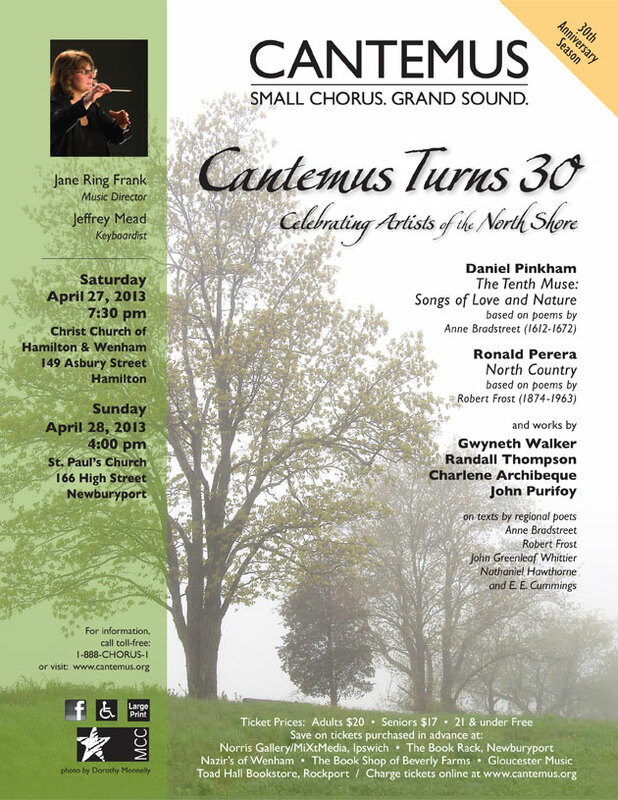 The group will perform “Cantemus Turns 30” on Saturday, April 27 at 7:30 p.m., at Christ Church of Hamilton-Wenham, 149 Asbury Street, Hamilton; and on Sunday, April 28 at 4:00 p.m. at St. Paul’s Church, 166 High Street, Newburyport.